The admissions to various colleges of the University of Delhi are based either on merit or entrance. 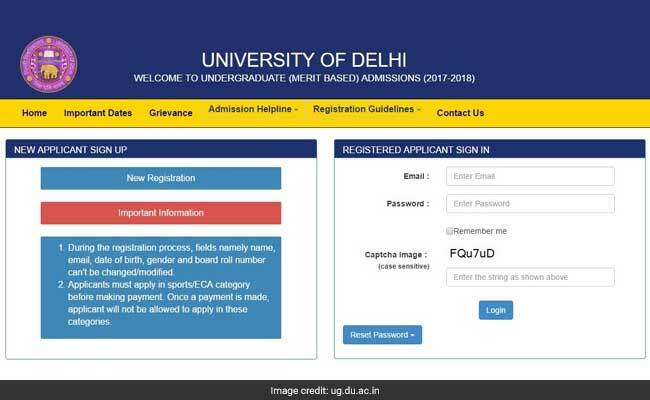 New Delhi: University of Delhi has opened the online registration window for the admission for the undergraduate courses from the colleges affiliated to the central varsity. The online registration for the merit based courses has started now and it will go on till June 12. The registration for the entrance based courses will start from May 31. According to an official, Delhi University's official registration website saw 200 registrations in the first 10 minutes after it was thrown open for the students. Applicants seeking admission to UG merit based programmes/courses must register on a centralized admission Web Portal. Applicants seeking admission to UG entrance test based need to apply on a separate portal for which the registration will start from 31st May 2017. Click on "Click Here" beside "Undergraduate (Merit Based) Admissions 2017"
Register yourselves after clicking on "New Registration"
To proceed further, the applicant must visit the UG Admission portal home page by clicking on the link, "Continue to homepage" on the left side of the screen. After logging in, the applicant can start the online registration process by clicking "Apply Now"
The entire registration form is divided into nine tabs (sections/pages) and applicant needs to enter details in each of the sections. In the first section/screen, the applicant needs to fill the "Personal Details" (as in the applicant's marksheets/certificates). In the second section/page, the applicant needs to enter the "Academic Details" (as in the Applicant's Certificates). In the third section/page, the applicant can select any number of programmes/courses based on applicant's eligibility. In the fourth (Sports) section/page, an applicant can select "Yes" for consideration of admission through sports quota. In the fifth (ECA Quota) section/page, the applicant can select "Yes" for consideration of admission through ECA quota. In the sixth section/page applicant needs to furnish the Bank Details for the refund of fee in case of cancellation of admission. In the seventh section/page is Mandatory Uploads; the candidates need tu upload photographs,scanned signatures, marksheets, Caste cirtificates, Sports/ECA cirtificates etc. In the eight section/page applicant can preview the complete application. In the ninth section/page, applicant can proceed to the online registration payment. The applicant can update information (except Name, email, gender, sports and ECA choices) already submitted in the application form by revisiting applicant's account till the last date of registration. The changes can be saved by clicking the "submit" button at the end of each page. During the registration process, fields namely name, email, date of birth, gender and board roll number can't be changed/modified. Applicants must apply in sports/ECA category before making payment. Once a payment is made, applicant will not be allowed to apply in these categories.